The practice has purpose built premises which offer a comprehensive range of facilities, including easy access and facilities for the disabled. All of the staff who work here are part of the health care team working for your benefit, but some staff are employees of the Walsall Community Health Trust and are attached to the Practice to provide additional local services. St. Peter's Surgery has been recognised as an Investor in People and is a GP Registrar training practice. The Doctors work as an unlimited Partnership to provide General Medical Services and enhanced services under the new NHS Contract from the above address. This surgery website is designed to provide you and your family with all of the basic details you require to enable you to make the best use of the services and facilities we offer. We will keep it current with any developments or other details that we feel are relevant to you. Please note: St. Peter's Surgery has updated it's Patient Confidentiality & Data Protection policies in order to comply with the General Data Protection Regulations. For more detailed information and information leaflet please see the "Practice Polices" link under further information (Right hand side of this page). A Patient information leaflet is also available from reception. 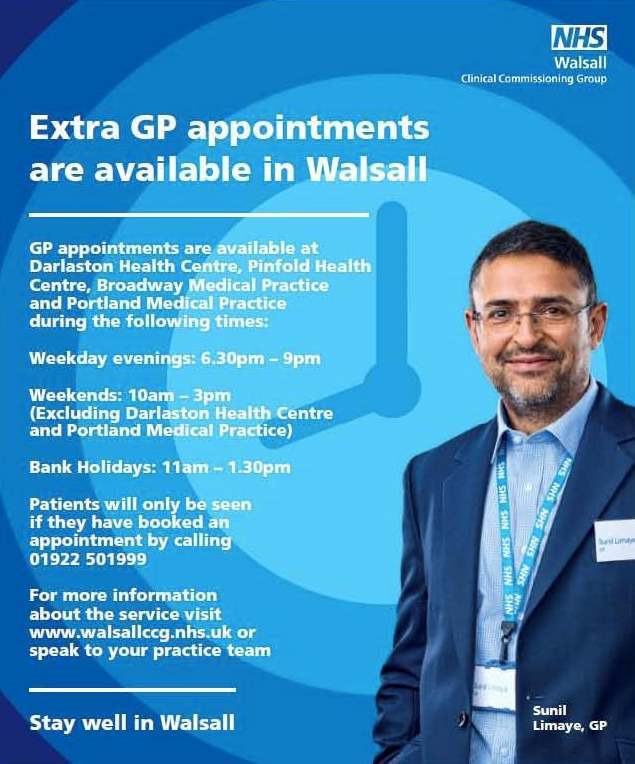 Patients registered with a Walsall GP can benefit from the Extended GP Access Service. NHS Walsall Clinical Commissioning Group (CCG) has worked with local GPs to create four “Hubs” based at Darlaston Health Centre, Pinfold Health Centre, Broadway Medical Practice and Portland Medical Practice. The “Hubs” are currently run by a group of local GPs. For further information please follow the above link. Dr M Crowther will be retiring from General Practice on 31st March 2019. We all wish him well for the future. Thank you all for the many expressions and notes of gratitude that I have received following my official retirement. When I started in the old surgery at Bate Street 34 years ago with Dr Barry I felt very privileged to be able to serve the local population. I always felt a genuine warmth from you all as I went about my work. One of the satisfying aspects of this job is meeting the children of those babies whom I saw in the early days during the postnatal visits and have observed them grow up over the years and now have started families of their own..
Moving to St Peters was a great benefit for all as it accommodated a growing practice population and enabled us to expand our team. The staff here I believe are the best . They go out of their way to assist wherever they can and are equally frustrated with the pressures that are placed upon them as the workload has increased. I am confident however that this teamwill go from strength to strength and continue to provide good care to you all..